Home News	Wedding Shoes: Heels or Flats? There’s no doubt that your wedding day is going to be one of the best days of your life. Many women have dreamed about their special day for years so it’s only right that you get everything absolutely perfect. Only second to your dress, comes the wedding shoes. Making sure they’re everything you want in terms of looks and practicality can be difficult, do you choose heeled wedding shoes or flat wedding shoes? There could be a number of factors that may influence your decision to go with heels over flats and vice versa. This could be anything from the weather conditions to the location of your wedding or it could just be down to comfort factor. Here we’re going to take a look at why you might choose one style of wedding shoes over another and what the benefits of each style can be. 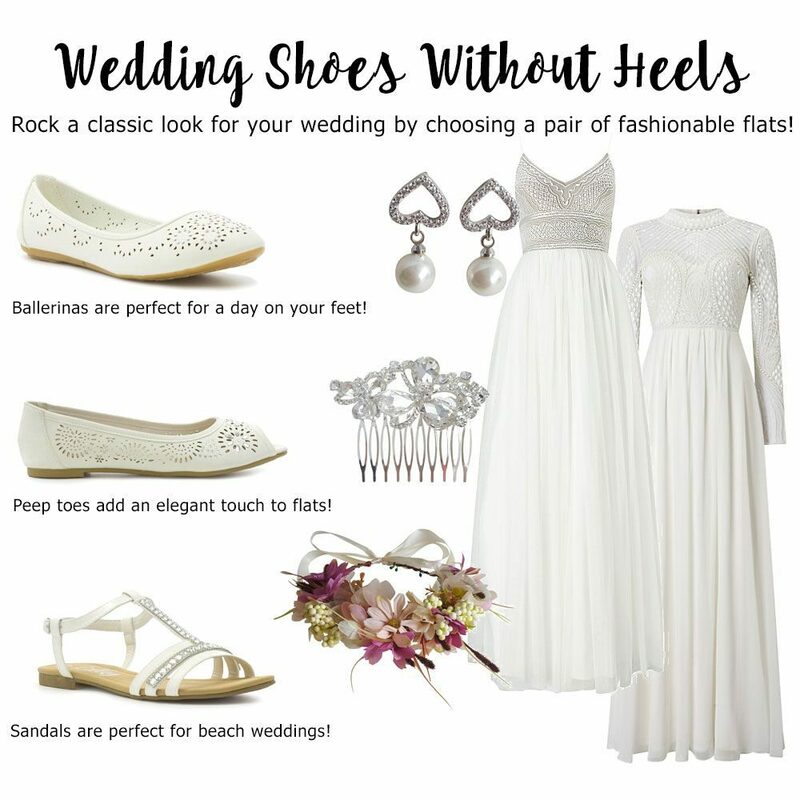 Choosing the right heeled shoes or sandals for your big day can be tricky, the first thing to ensure is that the heel height is right for you, after all you’re going to be wearing your wedding shoes for most of, if not all day. When choosing your heeled wedding shoes try a few pairs and wear each one for a number of minutes so you know how they’re going to affect you. If you feel any discomfort in your ankles or your feet when walking or you feel unsteady, a lower or chunkier heel will probably be best. Wedding shoes with block heels and a platform sole are a popular choice at the moment. If you’re determined to wear a pair of heels for your wedding but you’re not convinced you’d be able cope with high heels for the whole day, wedding shoes with kitten heels might be the best option for you. Wedding shoes with small heels are great because you get the best of both worlds; a feminine and delicate look without putting too much pressure on your feet. If you’d prefer a higher heel, there are precautions you can take to help protect against fatigue and sores. Using gel inserts on the heel, toes and balls of your feet can help prevent rubbing and add comfort where it’s needed most. Once you’ve decided on the height of the heel you’d like to go for, the next thing to decide is what style… do you want wedding shoes with glitter heels? What about wedding shoes with clear heels? There are so many styles to choose from it can be a little overwhelming but it really does come down to preference; some women prefer to go all out glitz and glam with rhinestones and crystals, while others prefer to keep things simple and delicate with materials like lace and satin. You’ll also want to consider the colour, traditionally white and ivory would be the colour of choice but it all comes down to personal preference, you may want to opt for a colour that matches your wedding theme, or a contrasting colour if you want something a little different… the only limitation is your imagination! TOP TIP: Always wear heeled wedding shoes around the house for a few hours prior to your big day. This will help to bed them in ready for long periods of wear. When it comes to choosing your wedding shoes, heels may not be for you. It may be that the location of your wedding is a little more “rustic” compared to your standard church wedding and heels aren’t a viable option. In that case, flat wedding shoes are the way forward. Choosing flat wedding shoes can be just as tricky as choosing wedding shoes with heels. Getting the fit right is extremely important, the last thing you want are sores and blisters when you’re walking down the aisle. The main things to look out for are width and ensuring you have enough space to move your toes. It’s not uncommon for your feet to swell throughout the day, especially if you’re on them for a long period of time. If you’re unsure what to look for when it comes to fit, our shoe fitting guide for women will help you get the best fit for you. Just because you’ve decided to go for wedding shoes without heels, it doesn’t mean they can’t be showstoppers too. Embellishments are really popular right now and flat wedding shoes with straps, bows or flowers are sure to get you noticed! Try flip flops, flat sandals or even ballet pumps for the ultimate in comfort. If you really want alternative wedding shoes to heels and you fancy something different to the norm, why not give trainers as wedding shoes a try? If you’re feet are wider than the average, flat wedding shoes for wide feet can be a great choice as they can often elongate the foot, making them look slimmer. Choose a pointed or peep toe to add length. If you’re planning a beach wedding or something a little more relaxed, you might want to consider sandals or flip flops. Gladiator sandals are a great for this, super comfortable and available in many different colours and styles. If your wedding is in winter however, always consider wearing flat shoes that have a hard sole and covered toe, this will help protect against the elements. TOP TIP: When buying flat wedding shoes, try to do this as late in the day as possible, this will allow your foot to swell, giving you a better idea of how they’ll fit over the course of the day. We all want to make sure that we have the perfect footwear for our wedding day, but we’re not all going to have the same preference when it comes to heel height and style. 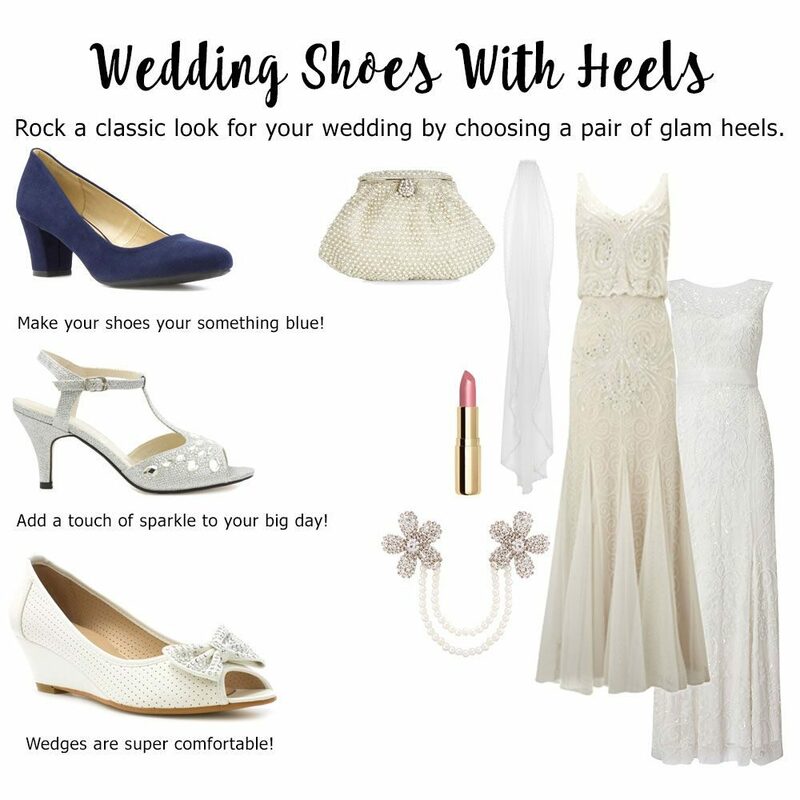 Choosing the right wedding shoes with heels or without can be tricky, but hopefully our tips will be able to help! The most important thing is to choose what’s right for you.